Written by 9/16/2008Share this story on Facebook! Ithaca College’s new Dorothy D. and Roy H. Park Center for Business and Sustainable Enterprise was recently awarded LEED (Leadership in Energy and Environmental Design) platinum certification, making it one of fewer than a dozen buildings on college campuses to have received this honor -- the highest awarded by the U.S. Green Building Council (USGBC). The building, opened this past spring, is the first business school in higher education to earn platinum level certification. 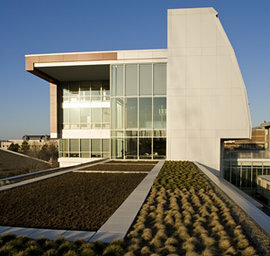 Globally, the building joins a small list of other facilities to have gained platinum certification from the USGBC, including the William J. Clinton Presidential Center, Discovery Communications global headquarters, the Kresge Foundation headquarters, and the USGBC headquarters (the LEED folks themselves). Construction on the College’s newest building, which will house many administrative offices including the Office of Admission, is well under way. The facility was designed by HOLT Architects to achieve LEED platinum certification and is scheduled to open in spring 2009.